4th set. Blue glitter with stars and disco balls inlay. Decorated with white ribbons. Anyway! It looks really glossy in real, with the sparkling blue stars. Chio! 5th set. 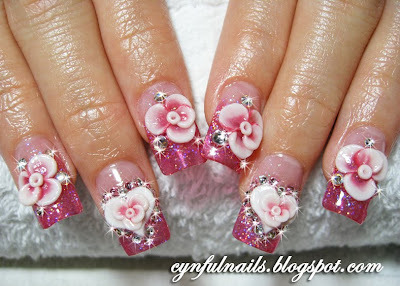 Fuschia pink glitter with roses and rose heart cushion. 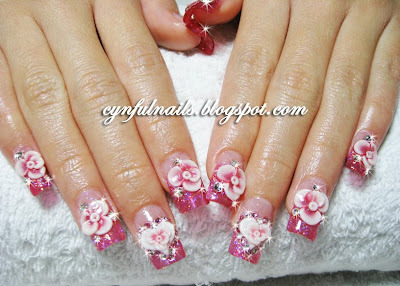 Of all the CNY nails I've done, this is one of the most girly ones! Huge blings and the close up of the roses. I almost died doing the uber tiny rose on the white cushion heart. Haha! But totally worth the effort! Super clear close up pic. I ♥ my Canon camera! 6th set. Red with laces and flowers! 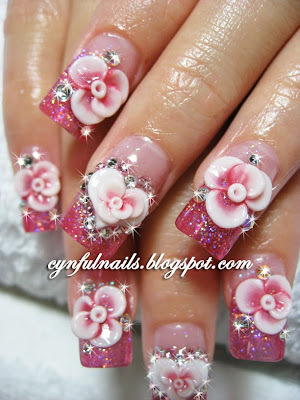 This is the last set of nails I did on CNY eve. 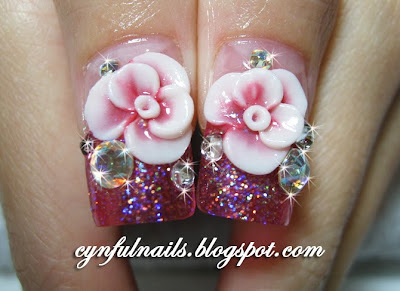 Last set, and the most CNY-ish of all! The laces and flower petals are done using light pink acrylic powder, and I also added a little peach powder to the flowers. Happy CNY to all of you! I will blog again within the next few days, that is if I'm not playing MJ. Hahaha!